Please note that the committee reserve the right to cancel a competition if there are less than eight entries. The first competition of the season was rearranged for the Spring Bank Holiday Monday with a 6pm start. Twenty one members entered and eventually Scott Harries beat Rob Steventon 21-19 in an excellent final which ended at 11.15pm. Losing semi-finalists in two outstanding games were Rob Renke (to Scott) and Albert Cornes. Eighteen members enjoyed a glorious afternoon on the Bylet in the annual Club Doubles. Above are a selection of photos from the day. Section 'A' was won by Chris Nock & Scott Harries. Section 'B' was won by Beryl Steadman & Rob Renke. Chris & Scott just edged an excellent final 15-14 with Rob having his last wood fall an agonising inch short. The finalists: Scott & Chris and Beryl & Rob. Thanks to everyone who helped make it a great Captains Day. 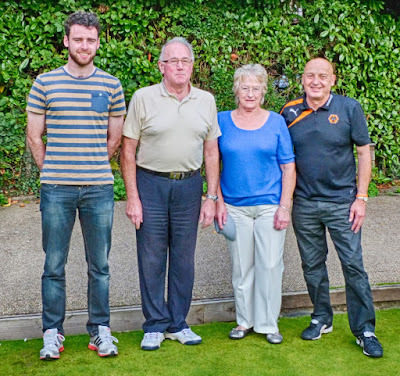 Twenty seven bowlers participated in the competition and eventually 'the real Walters' Barry proved a worthy winner beating Club Captain John Palmer 21-16 in the final. Losing semi-finalists were Geoff Carnell and Tony Steadman. Above are a selection of photographs from the day. Twenty three bowlers played in the competition and in an excellent final, Matt Ealey finally put an end to Rob Renke's dancing with a 21-9 success. Losing semi-finalists were Pete Driver and Georgina Marsh. The semi-finalists: Matt Ealey (winner), Pete Driver, Georgina Marsh and our President himself, Rob Renke (runner-up).